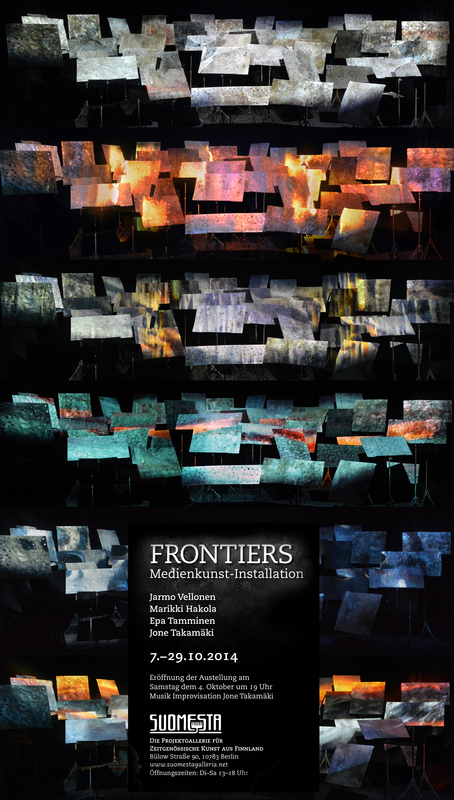 The media art installation ‘Frontiers’ consists of video projection, soundtrack and metal reliefs set upon note stands. The reliefs are based on the artwork ‘Vision’ by sculptor Jarmo Vellonen. The video projection by media artist Marikki Hakola and the soundtrack by sound designer Epa Tamminen launch a dialogue with reliefs, contemplating the perception and its interpretation. The audiovisual elements come forth, change and hide in the continuum of lights, shadows and tones of the video projection. Are the visual references of the reliefs signs of a life lived, pieces of a language long since disappeared, or the remains of structures mangled by war? ‘Frontiers’ invites the spectator to form one’s own personal interpretation.